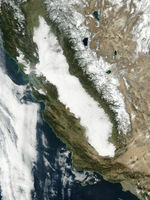 A thick bank of fog nestled down into the interior valleys of California on November 20, 2002. 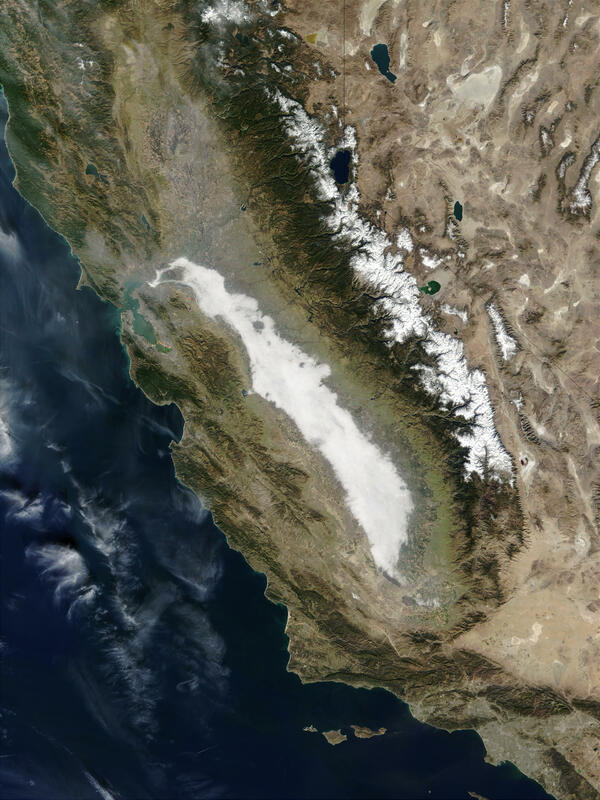 This true-color image was acquired by the Moderate Resolution Imaging Spectroradiometer (MODIS) on the Terra satellite around 11 a.m. local time, and the fog can be seen as a white blanket in the San Joaquin Valley. 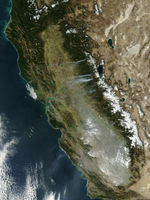 The northern margin of the fog reaches out toward San Francisco Bay, which appears turquoise. The dense fog was responsible for several car accidents in the region, including a 14-car pile up. 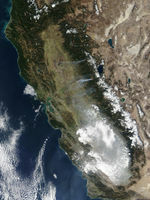 Along the border of California and Utah, the Sierra Nevada Mountains are capped with snow, with the lower slopes a dark, forest green. Where the border of the two states makes a sharp corner, deep-blue Lake Tahoe nestles amid the mountains. To its northwest is Nevadas Pyramid Lake. 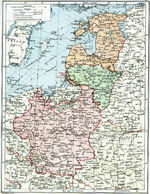 At the lower right corner of the image, the city of Los Angeles makes a cement-colored patch along the coast. 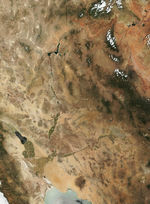 To its north, the tan-colored Mojave Desert points toward the Pacific.